L-R: CEO Legacy Sports, Philip Diwan; LaLiga Delegate in Nigeria, Javier del Rio; Marketing Manager Big Cola Nigeria, Perpetual Ohiri; Managing Director AJEAST Nigeria, Theo Williams; Head of International Partnership Sales, Gregory Bolle and LaLiga Ambassador, Mutiu Adepoju at the LaLiga & Big Cola Partnership Press Conference in Lagos. 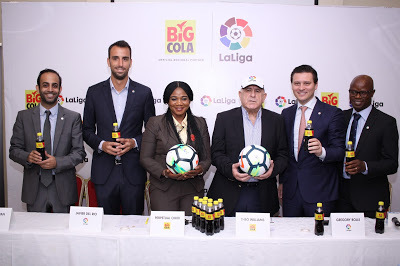 LaLiga and AJEAST Nigeria, the makers of Big Cola, have announced the signing of an agreement under which the multinational beverage company has become LaLiga's latest regional partner in Nigeria. The strategic partnership was announced at a press conference in Lagos, on Thursday April 26th, 2018. Gregory Bolle, LaLiga's Head of global partnership sales; Mr. Theo Williams, Country Director of AJEAST Nigeria; and Perpetual Ohiri, Marketing Manager Big Cola Nigeria, took center stage at this event. Philip Diwan, CEO of Legacy Sports, Javier Del Rio, LaLiga's Delegate in Nigeria, and LaLiga Ambassador, Mutiu Adepoju were also among those in attendance. The partnership further reinforces both LaLiga and AJEAST’s continued commitment to consumer satisfaction in Nigeria. 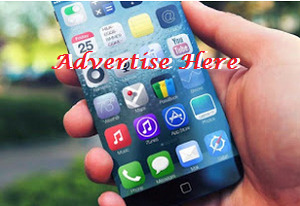 Moreover, it will enable the beverage company – who are a major stakeholder in the Nigerian fast moving consumer goods industry – to offer its customers access to exclusive content related to the Spanish football competition. Following the signing of the agreement, Gregory Bolle, LaLiga's Head of Global Partnership Sales, noted: "LaLiga loves Africa and Nigeria is a strategic country for us, because of its fans and numerous football talents such as Francis Uzoho (Deportivo de la Coruna) and Oghenekaro Etebo (UD Las Palmas). LaLiga is proud to kick off this partnership with a leading beverage brand such as Big Cola. This partnership will allow our millions of Nigerian LaLiga fans to further engage with the best league in the world. Through this innovative collaboration with Big Cola, we will prove once again that we are committed to becoming closer than ever to our fantastic Nigerian fans." Meanwhile, Mr. Theo Williams, Country Director of AJEAST Nigeria, stated: "We are proud to launch this partnership with LaLiga. This partnership provides us with a remarkable platform to broaden Big Cola’s profile and values, while giving us another opening to create distinctive experiences for football fans all over Nigeria." Under this agreement, AJEAST Nigeria, will gain access to Intellectual Property and marketing rights, tickets and hospitality deals, merchandising, rights to digital assets and social media, public viewing events for El Clásico, access to trophy tours and exclusive content from the 20 clubs participating in the Spanish top flight league. The partnership reaffirms AJEAST’s status as a major player in the development of football in Nigeria, while further illustrating LaLiga’s successful international expansion in Africa to get closer to its Nigerian fans. The partnership with Big Cola continues LaLiga’s commitment to Nigeria, joining projects already taken up by the LaLiga office in Nigeria, such as the MoU signing with the NPFL, the NPFL All-Star Trip to Spain, the Legacy Sports Partnership, the LaLiga - NPFL coaching seminar for Nigerian youth coaches, the NPFL U-15 tournament, the MoU signing with the NWFL, and the official LaLiga in Naija media event.